in eating the forbidden fruit? In order to accomplish his work unperceived, Satan chose to employ as his medium the serpent—a disguise well adapted for his purpose of deception. The serpent was then one of the wisest and most beautiful creatures on the earth. It had wings, and while flying through the air presented an appearance of dazzling brightness, having the color and brilliancy of burnished gold. Resting in the rich-laden branches of the forbidden tree and regaling itself with the delicious fruit, it was an object to arrest the attention and delight the eye of the beholder. Thus in the garden of peace lurked the destroyer, watching for his prey. The angels had cautioned Eve to beware of separating herself from her husband while occupied in their daily labor in the garden; with him she would be in less danger from temptation than if she were alone. But absorbed in her pleasing task, she [p. 54] unconsciously wandered from his side. On perceiving that she was alone, she felt an apprehension of danger, but dismissed her fears, deciding that she had sufficient wisdom and strength to discern evil and to withstand it. Unmindful of the angels' caution, she soon found herself gazing with mingled curiosity and admiration upon the forbidden tree. 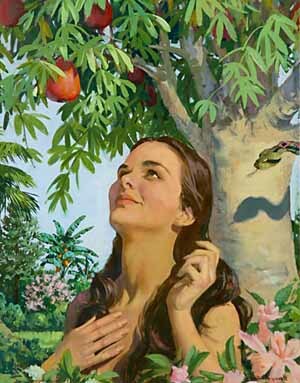 The fruit was very beautiful, and she questioned with herself why God had withheld it from them. Now was the tempter's opportunity. As if he were able to discern the workings of her mind, he addressed her: "Yea, hath God said, Ye shall not eat of every tree of the garden?" Eve was surprised and startled as she thus seemed to hear the echo of her thoughts. But the serpent continued, in a musical voice, with subtle praise of her surpassing loveliness; and his words were not displeasing. Instead of fleeing from the spot she lingered wonderingly to hear a serpent speak. Had she been addressed by a being like the angels, her fears would have been excited; but she had no thought that the fascinating serpent could become the medium of the fallen foe. Such has been Satan's work from the days of Adam to the present, and he has pursued it with great success. He tempts men to distrust God's love and to doubt His wisdom. He is constantly [p. 55] seeking to excite a spirit of irreverent curiosity, a restless, inquisitive desire to penetrate the secrets of divine wisdom and power. In their efforts to search out what God has been pleased to withhold, multitudes overlook the truths which He has revealed, and which are essential to salvation. Satan tempts men to disobedience by leading them to believe they are entering a wonderful field of knowledge. But this is all a deception. Elated with their ideas of progression, they are, by trampling on God's requirements, setting their feet in the path that leads to degradation and death. Satan represented to the holy pair that they would be gainers by breaking the law of God. Do we not today hear similar reasoning? Many talk of the narrowness of those who obey God's commandments, while they themselves claim to have broader ideas and to enjoy greater liberty. What is this but an echo of the voice from Eden, "In the day ye eat thereof"—transgress the divine requirement—"ye shall be as gods"? Satan claimed to have received great good by eating of the forbidden fruit, but he did not let it appear that by transgression he had become an outcast from heaven. Though he had found sin to result in infinite loss, he concealed his own misery in order to draw others into the same position. So now the transgressor seeks to disguise his true character; he may claim to be holy; but his exalted profession only makes him the more dangerous as a deceiver. He is on the side of Satan, trampling upon the law of God, and leading others to do the same, to their eternal ruin. The serpent plucked the fruit of the forbidden tree and placed it in the hands of the half-reluctant Eve. Then he reminded her [p. 56] of her own words, that God had forbidden them to touch it, lest they die. She would receive no more harm from eating the fruit, he declared, than from touching it. Perceiving no evil results from what she had done, Eve grew bolder. When she "saw that the tree was good for food, and that it was pleasant to the eyes, and a tree to be desired to make one wise, she took of the fruit thereof, and did eat." It was grateful to the taste, and as she ate, she seemed to feel a vivifying power, and imagined herself entering upon a higher state of existence. Without a fear she plucked and ate. And now, having herself transgressed, she became the agent of Satan in working the ruin of her husband. In a state of strange, unnatural excitement, with her hands filled with the forbidden fruit, she sought his presence, and related all that had occurred. Adam understood that his companion had transgressed the command of God, disregarded the only prohibition laid upon them as a test of their fidelity and love. There was a terrible struggle in his mind. He mourned that he had permitted Eve to wander from his side. But now the deed was done; he must be separated from her whose society had been his joy. How could he have it thus? Adam had enjoyed the companionship of God and of holy angels. He had looked upon the glory of the Creator. He understood the high destiny opened to the human race should they remain faithful to God. Yet all these blessings were lost sight of in the fear of losing that one gift which in his eyes outvalued every other. Love, gratitude, loyalty to the Creator—all were overborne by love to Eve. She was a part of himself, and he could not endure the thought of separation. He did not realize that the same Infinite Power who had from the dust of the earth created him, a living, beautiful form, and had in love given him a companion, could supply her place. He resolved to share her fate; if she must die, he would die with her. After all, he [p. 57] reasoned, might not the words of the wise serpent be true? Eve was before him, as beautiful and apparently as innocent as before this act of disobedience. She expressed greater love for him than before. No sign of death appeared in her, and he decided to brave the consequences. He seized the fruit and quickly ate. Adam could neither deny nor excuse his sin; but instead of manifesting penitence, he endeavored to cast the blame upon his wife, and thus upon God Himself: "The woman whom Thou gavest to be with me, she gave me of the tree, and I did eat." He who, from love to Eve, had deliberately chosen to forfeit the [p. 58] approval of God, his home in Paradise, and an eternal life of joy, could now, after his fall, endeavor to make his companion, and even the Creator Himself, responsible for the transgression. So terrible is the power of sin. When the woman was asked, "What is this that thou hast done?" she answered, "The serpent beguiled me, and I did eat." "Why didst Thou create the serpent? Why didst Thou suffer him to enter Eden? "—these were the questions implied in her excuse for her sin. Thus, like Adam, she charged God with the responsibility of their fall. The spirit of self-justification originated in the father of lies; it was indulged by our first parents as soon as they yielded to the influence of Satan, and has been exhibited by all the sons and daughters of Adam. Instead of humbly confessing their sins, they try to shield themselves by casting the blame upon others, upon circumstances, or upon God—making even His blessings an occasion of murmuring against Him. Eve was told of the sorrow and pain that must henceforth be her portion. And the Lord said, "Thy desire shall be to thy husband, and he shall rule over thee." In the creation God had made her the equal of Adam. Had they remained obedient to God—in harmony with His great law of love—they would ever have been in harmony with each other; but sin had brought discord, and now their union could be maintained and harmony preserved only by submission on the part of the one or the other. Eve had been the first in transgression; and she had fallen into temptation by separating from her companion, contrary to the divine direction. It was by her solicitation that Adam sinned, and she was now placed in subjection to her husband. Had the principles [p. 59] joined in the law of God been cherished by the fallen race, this sentence, though growing out of the results of sin, would have proved a blessing to them; but man's abuse of the supremacy thus given him has too often rendered the lot of woman very bitter and made her life a burden. It was not the will of God that the sinless pair should know aught of evil. He had freely given them the good, and had withheld the evil. But, contrary to His command, they had eaten of the forbidden tree, and now they would continue to eat of it— they would have the knowledge of evil—all the days of their life. From that time the race would be afflicted by Satan's temptations. Instead of the happy labor heretofore appointed them, anxiety and toil were to be their lot. They would be subject to disappointment, grief, and pain, and finally to death. Under the curse of sin all nature was to witness to man of the character and results of rebellion against God. When God made man He made him rule over the earth and all living creatures. So long as Adam remained loyal to Heaven, all nature was in subjection to him. But when he rebelled against the divine law, the inferior creatures were in rebellion against his rule. Thus the [p. 60] Lord, in His great mercy, would show men the sacredness of His law, and lead them, by their own experience, to see the danger of setting it aside, even in the slightest degree. The warning given to our first parents—"In the day that thou eatest thereof thou shalt surely die" (Genesis 2:17)—did not imply that they were to die on the very day when they partook of the forbidden fruit. But on the day the irrevocable sentence would be pronounced. Immortality was promised them on condition of obedience; by transgression they would forfeit eternal life. That very day would be doomed to death. The tide of woe that flowed from the transgression of our first parents is regarded by many as too awful a consequence for so small a sin, and they impeach the wisdom and justice of God in His dealings with man. But if they would look more deeply into this question, they might discern their error. God created man after His own likeness, free from sin. The earth was to be peopled with beings only a little lower than the angels; but their obedience must be tested; for God would not permit the world to be filled with those who would disregard His law. Yet, in His great mercy, He appointed Adam no severe test. And the very lightness of the prohibition made the sin exceedingly great. If Adam could not bear the smallest of tests, he could not have [p. 61] endured a greater trail had he been entrusted with higher responsibilities. Then they that have kept God's commandments shall breathe in immortal vigor beneath the tree of life; and through unending ages the inhabitants of sinless worlds shall behold, in that garden of delight, a sample of the perfect work of God's creation, untouched by the curse of sin—a sample of what the whole earth would have become, had man but fulfilled the Creator's glorious plan. Click here to read the next chapter: "The Plan of Redemption"